Car polishing should not be misinterpreted with paint correction. Polishing is a process to enhance the vehicle’s paintwork by using abrasives to slowly level out small surface defects within your vehicle’s paint. In this process, the polishing abrasives will fill and mask such defects. In a paint correction process, the defects are actually removed by removing some of the clear coat through additional leveling. The video below is an example of our Paint Enhancement Treatment, which consists of performing an iron decontamination wash, a clay bar treatment, polishing, and adding a polymer sealant. Waxing is the process of adding protection to your vehicle’s paintwork after the polishing treatment. Wax is a natural carnauba product which does not contain abrasives or paint fillers. It is applied to a freshly polished surface to add depth to the finished paintwork. A polymer sealant on the other hand is man-made synthetic application which is also used to protect the paintwork after polishing. However, because a polymer sealant is a synthetic product, it tends to be much more durable than natural wax. 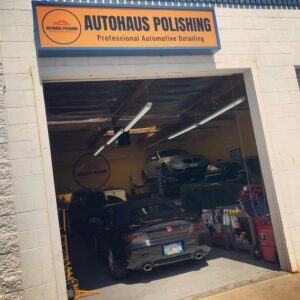 To book an appointment for your car polishing treatment, contact one of our IDA Certified techs at 661-200-0710, or reach us online.